Haunted by the trauma of the taking and losing of lives as a young Israeli man thrust into wartime to serve as a tank gunner at the 1982 start of the first Lebanon war, it took over twenty-five years for director Samuel Maoz to write the first intensely personal draft of what would become his viscerally supercharged work, Lebanon . Throughout Maoz's Venice and Toronto Film Festival award-winning opus, the writer/director challenges our expectations with his brave decision to avoid traditional plot structure altogether. Rather than simply offering us a melodramatic interpretation of what he'd encountered as a wide-eyed, naive soldier pushed into the position of firing on anything that moved on the opposite end of his weapon's scope, Maoz's Lebanon is an experiential and decidedly experimental picture that requires you to "live" the action instead of passively watching the events unfold. Fittingly, he forces us to see the events he encountered from his point-of-view using a literal, bold approach to keep us frightened, filthy and on emotionally edge by setting the entire film inside the claustrophobic tank. And watching Lebanon just a few days before settling in for 2010's Buried , which was staged inside a coffin, made me accutely aware of just how brilliantly effective it was for the filmmakers to play with traditional point-of-view to push the cinematic medium forward in terms of what it can do to bring us into the film naturally rather than with gimmicks like 3D. 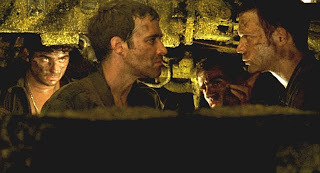 For even though they look indestructible and untouchable from the outside, we soon learn that the Israeli tank is as capable of ending the life it finds outside its doors as it is of destroying the lives inside the steel vehicle, if any number of very possible catastrophes should occur during the course of the film's ninety-three minute running time. 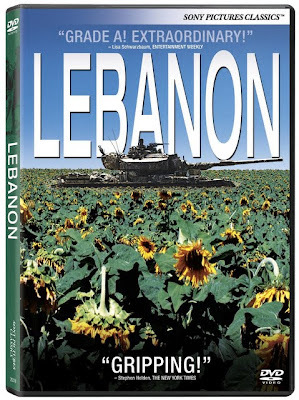 Admittedly shorter by contemporary standards and noticeably so for a war picture, the movie's length is nonetheless ideal for Lebanon given the film's unrelenting tension, psychological overload, and sense of imminent paranoiac doom that pervades throughout. And admirably, the perfect justification Lebanon 's length and the movie's point-of-view can be found within the close of the picture. Although the film is bookended with the same deceptively simple beautiful image of nature witnessed in the opening shot, facing it once more as the abrupt final coda to the agonizing journey of war makes us realize how much we've changed. Namely, even though the picture remains the same, things just don't look so simple anymore and the fact that viewers can feel even a small fraction of the emotional response that haunted Maoz for twenty-five years makes Lebanon a cinematic success through and through. While venturing into foreign lands along with a handful of complicated, inevitably mismatched, adrenaline-fueled personalities captured in tight close-ups to reaffirm the close quarters, we encounter a hardened, experienced “loader” and our temporarily innocent gunner (Maoz's alter-ego) struggling to survive along with the rest. Yet regardless of the fact that it comes from a real place, because stylistically Lebanon simply lets things happen to better reflect the “you never know what's around the bend,” confusing madness of war rather than worrying about telling us mini-stories with a distinct beginning, middle and end, the film can feel conveniently episodic and slightly emotionally manipulative at times. Nonetheless, Maoz's powerful, ambitious and compelling Lebanon is an unshakably strong production that remains a worthwhile portrait of a young solider during wartime. However, shockingly and despite receiving a 100% positive Top Critics rating on Rotten Tomatoes, Lebanon was tragically overlooked in its limited theatrical run. 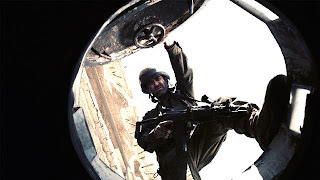 Upon further research, I learned that Maoz's film is considered one of the decade's most controversial antiwar films and it wasn't simply due to the fact that it all took place inside a tank. For instead of watching Maoz's work as an overall antiwar movie similar to the way that many U.S. viewers on all sides of the political spectrum have done to appreciate films like The Hurt Locker and The Deer Hunter even though our government sent our troops to war, Israel felt that Lebanon was an indictment against their administration made by one of the country's former soldiers. 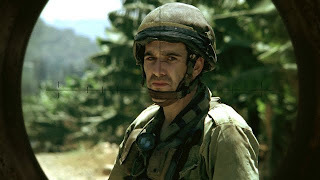 Nonetheless, despite Israel's disapproval of the content as well as their failure neither to submit Lebanon for Academy Award consideration nor offer it a wide theatrical release in its home country, regardless of our politics, ultimately Maoz's movie is a thrillingly inspiring example of film as cathartic autobiography that transcends borders to encourage conversation by bringing us into battle.